For those who missed a beautiful Spring day in The Beach, this post has been updated with photos. After the road construction project of 2013 that rebuilt Kingston Road from Queen to Victoria Park including streetcar track, water mains, sidewalks and roads, the TTC had planned a celebration last December with free rides on a Sunday afternoon. Then there was a little storm. Streetcar overhead wires were thickly coated in ice, tree branches were down everywhere, and the celebration was put on hold. On Sunday, March 30 from noon to 4:00pm, the TTC will operate a PCC shuttle on Kingston Road between Woodbine and Bingham Loops. For the railfans among my readers (you know who you are) this will be a rare chance to see a car looping back east from Woodbine Loop rather than the much more common short turns in the opposite direction. For the sharp eyed, these photos were taken over the course of several trips between Woodbine and Bingham Loops. They are presented here by location rather than by time. On the last round trip, I rode the car and enjoyed one of the treats visible only from inside: a reflection of 4549 in the shop windows as we passed. 4549 pulls out of Woodbine Loop onto Queen Street. The Yonge Subway celebrates its 60th birthday this weekend on March 30, 2014. In honour of the occasion, I have scanned in a few transfers from the era predating the opening. With the exception of the souvenirs from 1953, these were rescued from oblivion when the TTC was cleaning house of old files at Hillcrest Transportation many years ago. The Toronto Transit Commission Board will meet on March 26, 2014 at 1:00 pm in Council Chambers at City Hall. The Agenda contains a number of items of interest. A new website has been created under the name regionalrelief.ca with links to various aspects of these studies. There are three main branches only one of which contains new content. The Metrolinx branch takes readers to the Metrolinx Regional Relief Strategy project page which reflects the status as of the February 2014 board meeting. The City of Toronto branch goes to a subsite dedicated specifically to the Project Assessment for the Relief Line. This includes a mechanism for public participation in formulation of the Terms of Reference for this study. The York Region branch goes to the VivaNext page for the Yonge subway Richmond Hill extension. I will update this article if new material appears before the public meetings. In previous articles, I wrote about the decline in transit service thanks to the budget cutbacks of the Ford/Stintz regime, and about the potential for short term improvements. This article looks at improvements in more detail in light of a recent policy announcement by Mayoral candidate Olivia Chow that she would increase service by 10% to reduce crowding. What would a service increase look like “on the ground”, and what resources would it require? When is “LRT” not LRT? In all the debates about transit options, be they in Scarborough or elsewhere, one of the most abused and frequently misunderstood terms is “LRT”. The term appears in various contexts over the years under both the guise “Light Rail Transit” and “Light Rapid Transit”. The difference can be more in local preference including marketing aims. One can even find “LRRT” where a proposal tries to be all things to be all people. The Buffalo line, which incongruously runs on the surface downtown, but in a tunnel elsewhere, originally used this term, but was rebranded “Metro Rail”. The “LRRT” term, however, is still in current use as a Google search will demonstrate. any technology requiring a dedicated, segregated guideway and stations either because of automated control systems or because the right-of-way cannot be crossed for various reasons. The Boston Green Line is the oldest subway on the continent, and it runs with “streetcars” that morph into “light rail vehicles” not because of magic performed where they leave the street pavement, but because of the way the vehicles are used. This is central to the concept of “LRT” – the ability to operate in many environments as appropriate to demand and local circumstance. Unlike what Toronto calls a “subway”, an LRT network can adapt to its surroundings and this is a fundamental characteristic of the mode. 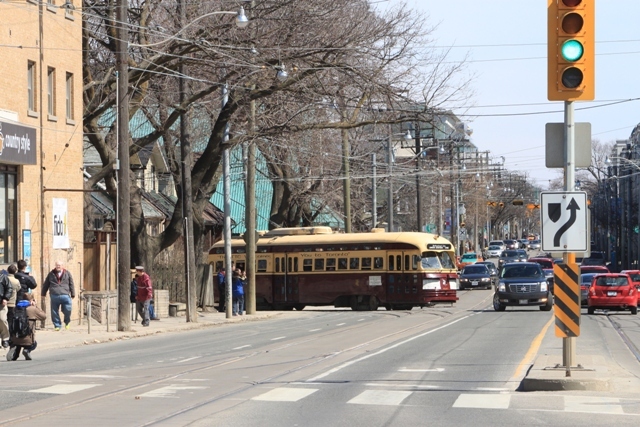 The original Scarborough LRT would have run at grade with some road crossings enroute, and a Malvern extension was on the books, but never built. Since the municipal campaign began earlier this year, I have been approached by a few candidates and/or by their organizations for my thoughts on transit issues. All of this has been on a pro bono basis. I am not working for any of the campaigns, nor do I intend to take up that role. My aim is to improve the quality and “literacy” of discussions about transit issues. Whether the candidates or their teams agree or incorporate my thoughts is their own matter. It is far to early in the campaign to even think about endorsements, and if I make any, this will be much closer to voting day when the candidates and their platforms have been tested by several months of campaigns and scrutiny. The readership here is not huge, and the idea that I could sway a significant voting block is laughable. My personal voting preferences will be based on more than just the transit file, but this site is not a place for discussion of issues from municipal portfolios beyond transportation. As transit issues develop in the campaign, I will write about them here, although I do not intend to rehash the entire Scarborough subway/LRT debate beyond clarifications or challenges to misleading information. Frankly there are more important matters to talk about, and a pro-transit candidate should not make this the sole plank of their platform however they stand on the question. My door, so to speak, is open to those who want to talk about transit, although I suspect certain candidates won’t be calling. How Long Would The Scarborough LRT Construction Require? With the emergence of two candidates for Mayor of Toronto who support the Scarborough LRT scheme, we are bound to hear much talk about how long construction would take, how long SRT riders would be forced to ride shuttle buses, and when the line might open. In this context, it’s worth looking back at Metrolinx plans before various politicians decided to buy votes in Scarborough with a subway line. The TTC’s original plans were to rebuild the SRT before the Pan Am Games. That schedule went out the window when then-Premier McGuinty pushed out the delivery plans for the Transit City projects so that most of the spending would occur after the provincial deficit was under control if not eliminated. Also lost in the shuffle was the idea that the Sheppard LRT would be in operation before the SRT shutdown as an alternate route for people from northern Scarborough to reach the subway system. Build the north end of the Scarborough LRT line from Sheppard to a point just east of McCowan Yard. Rebuild the existing SRT as an LRT line. Only this part of the project would require a shutdown of SRT service. As momentum grew for the subway proposal, it suited proponents to treat the entire project timeline as the shutdown period for the SRT, and thus we began to hear of a four-year long period when riders would be taking bus shuttles. The situation was not helped by the fact that Queen’s Park and Metrolinx talked of the Scarborough LRT opening “by 2020” even though it could be finished far earlier. System riding grew by about 22% from 2006 to the projected demand in 2014. The bus fleet, after increasing by about 22% early in that period in part for the Ridership Growth Strategy (RGS), has not grown since 2009. The capacity of the bus fleet has dropped by about 6% as the remaining high-floor fleet was replaced with low-floor buses. Although RGS improved crowding standards to encourage more riding, these changes were reversed in 2012 to fit more passengers on existing vehicles. The streetcar fleet size has not changed at all, and peak service improvements, such as there were any, came from redeploying vehicles from routes shut down for construction projects. Changing the level of TTC service on a broad scale is not something anyone can do overnight. More service means more buses and streetcars, more operators and more garage capacity. All of this takes more operating and capital subsidy, and a sustained commitment that lasts longer than a campaign sound-bite.